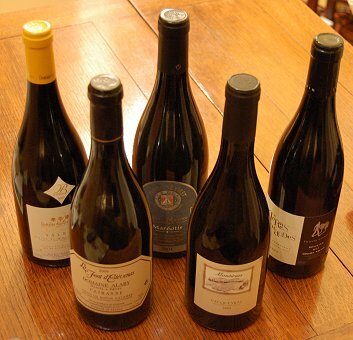 This selection of wines from the Rhône Valley includes some biodynamic wines and wines from smaller producers that represent not just good value for excellent wines, but a real point of difference from the high street. The wines are reviewed below, and apart from one Cabernet Franc from the Loire Valley, are all from the famous villages of the Côte-du-Rhône. The Three indivudual Villages represented are Cairanne, Valréas amd Vacqueyras. This Cabernet Franc from the Loire Valley comes from a producer whose wines I normally enjoy very much. It comes from old organically-farmed vines giving very low yields, and the domaine has achieved the unofficial classification of ‘cru exceptionnel’ from Revue du Vin de France. It has an inky crimson colour, and a beguiling nose, with dark, earthy black cherry fruit combining with subtle, powerful oak and a certain leafy, undergrowthy quality. On the palate this is a decisive wine, with a huge concentration to the fruit that is chewy, dense and inky, with a distinctive and powerful minerality adding a graphite edge. With powerful tannins and loads of acidity this is a baby that needs a few years in the cellar, or to be matched now to the right grilled meat or casserole dish. £12.00. Valréas is one of the Côtes du Rhône Villages, and this blend of Grenache, Carignan and Syrah comes from a family-run estate and a block of wines that average 40 years of age. Pouring a moderately deep, bold ruby to crimson colour, the sweetness and ripeness of the bountiful fruit leaps from the glass, suggesting creamy raspberries and juicy blackberries, with just an elegant little note of pepper and spice too. On the palate the fruit really drives this wine, with the same crisp but ripe and sweet berry fruits, and a very nice, pacy, lean and savoury tannin framework holding everything very taut and precise. I like the acidity on this 2003, and this harmonious wine drinks well, the finish supported by a little charry, coffeeish oak. £8.25. Vacqueyras is another of the Côtes du Rhône Villages, and the biodynamic estate of Montirius is run by husband and wife team, Christine and Eric Saurel. Made from 40-year-old vines, the Saurel’s consider this to be their ‘benchmark’ wine. It has a medium/deep crimson colour, and a beautifully poised nose, with an abundance of cherry and blackcurrant fruit and a savoury, cedar and pepper background. There’s just a touch of gaminess too. On the palate this has excellent acidity despite coming from a very hot vintage, with a really curranty sweetness and intensity to the wine. There’s no sign of over-extraction as fairly flowing, though grippy tannins kick in. This loosened up in the glass, and decanting for a couple of hours should just soften that grippy character nicely. £9.25. From the Côtes du Rhône Villages of Cairanne, this wine (60% Syrah, 40% Grenache) is the prestige wine from a 10th generation producer, who uses very natural, non-interventionist techniques in vineyard and cellar. It pours a medium density purple/crimson colour, and the nose really expresses the Syrah component powerfully, with pepper and cedar playing against bold black fruit and a certain gamy quality. On the palate this has real edge and life about it, with a fine, lean, savoury cut to the tannins and acidity, and all sorts of mineral and earthy notes supporting the core of black fruits. Fairly tight and lean, this is a decisive and savoury wine of huge style and quality, but again it needs food or a couple of years in the cellar to tame its forceful personality. £9.75. Composed of 67% Grenache and 33% Syrah, this is one of the best domaines of the region, and the cuvée Maréotis is a special selection from their oldest vines in their biodynamic best vineyard plots around the Côtes du Rhône Villages. It has a deep, vibrant colour and an absolutely huge nose, bursting with dense, sweet, earthy plum and black berry fruits, all edged with a touch of overripe Porty volatility and a little touch of Brettanomyces, that all adds up to a powerful, layered and complex picture. On the palate there’s a bloody, gamy, very animal edge to this wine, as super ripe fruit floods across the palate. It has a smooth but powerful backbone of tannin and acidity, giving a certain lean, even slightly astringent note that just detracts slightly for me, though the savoury grip confirms this as a pretty profound Côtes du Rhône. £13.50.